This arrived in the mail today from the hilarious NeuronDoc. 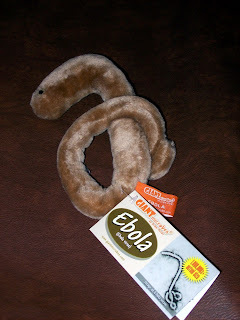 That's right, it's a plush ebola. How cool are my friends? Seriously, how cool? Thanks, NeuronDoc! You made me laugh out loud. Oh MAN! I wish I'd have thought of that! Plush microbes are the BEST! Doc, twisted minds think alike, because I am TOTALLY going to do that if I end up with a job that requires I leave the house. That is SO awesome, Natalie!